The five Roloff children are pictured with their dog, Brutus, who needs expensive, lifesaving treatment to survive his cancer. GRAFTON — When the Roloff family of Grafton discovered that their beloved dog, Brutus, had cancer, their concern for Brutus’ health was compounded by their alarm about the high cost of his chemotherapy treatment. 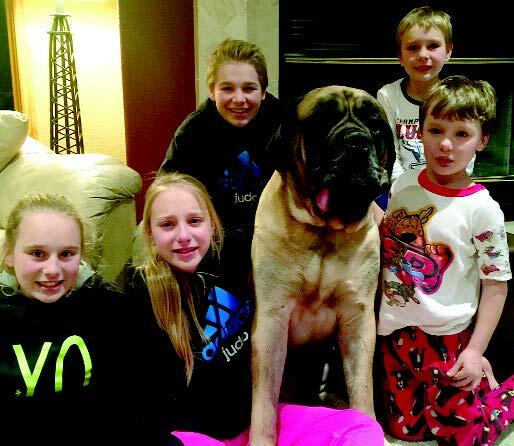 Brutus, a 6-year-old English mastiff, was found to be suffering from lymphoma during a routine vet appointment in March. Doctors told Brutus’ owner, Dawn Roloff, that treatments could cost up to $6,000 – an insurmountable sum for the Roloffs, who have five children ages 6 to 15. After hours spent scouring the Internet for a possible solution, the Roloffs found the Magic Bullet Fund, an initiative of the Maryland-based Perseus Foundation that helps financially needy families cover the cost of canine cancer treatment. The MBF donates money to the dog’s treatment and helps the family coordinate a 30-day fundraising campaign to cover the rest of the costs. The Roloffs applied for the MBF and were accepted; they now have until May 14 to raise as much money as possible for Brutus’ care. Brutus, said Roloff, is a quirky, lovable companion who came to the family at a particularly difficult time four years ago. They were just getting over the death of their last dog, another English Mastiff, who suffered from a genetic disease, and Dawn’s husband, Christopher, had just lost his job and would remain out of work for three years. Tax-deductible donations to the fund for Brutus’ cancer treatment can be made by visiting http://themagicbulletfund. org/donatedog/. Any money not used for Brutus’ care will be distributed to the MBF general fund and appropriated toward treatment for other dogs suffering from cancer. The MBF was founded in 2005 by animal writer Laurie Kaplan, whose Siberian husky, Bullet, endured a lengthy battle with lymphoma. The organization has assisted in obtaining care for more than 350 dogs. MBF accepts only cases where there is hope that treatment will add at least a year of “high-quality life” for the dog. Funds are never used for euthanasia or palliative care. The Roloffs hope that, through successful chemotherapy treatment, their beloved Brutus will have a fighting chance at overcoming his cancer. To help the Roloff family pay for the estimated $6,000 in costs associated with their dog’s cancer, go to http://themagicbulletfund. org/donate-dog. The deadline to help is May 14.